We have done few tests on Smartron LA-E808 and 3M LD-6000 for the purpose of research, these tests are helpful to understand the information that someone may be needed. Smartron Eye Pro LA-E808 has a evenly luminous intesity distribution than 3M LD6000 as you can see here. To compare the effect of these 2 LED Lamp comparison. 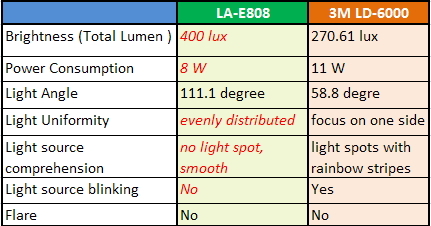 Please must CLICK TO ENLARGE to see the situation to the reduction of the glare, LA-E808 has very less glare reflection in the test while 3M LD 6000's has more glare. There is absolutely no image modifying software of any kind used in here. Base on Japenese brand Nikon D5200 to make the photo. By using the Side Double Refraction Technic, Smartron LA-E808 performs a even and smooth light as you can click to enlarge the picture. For 3M LD6000, we discovered a serous blinking strips here. As you click to enlarge the 3M LD6000 picture, you can see the LED light on the right is much brighter than the left side, the contrast is so obvious and barely can observe the rainbow strips on the right. Smartron LA-E808's light source is stable, even and balanced without flickering and rainbow strips. Enter a brief description of this pair of images here to help your visitor understand how they're related. If you're showing before and after photos, for example, you might point out some of the improvements from one to the other.